With the Envirochem Closed Loop System, you can select up to 5 products, custom blended to your needs. No Measuring, No Pouring – Exact Dosage every time to your mop bucket or spray bottle. Color coded product, available in ½, 1 and 2.5 gallon containers with matching spray bottles. CLS9 is also effective against the Human Corona Virus, which is linked to the SARS, and H1N1, S. typhosa, Staph aureus (antibiotic resistant variations), E. coli, S. choleraesuis, A. aerogenes, Staphylococcus aureus, Salmonella typhosa, Streptococcus pyogenes, Salmonella pullorum and Salmonelli schottmulleri. 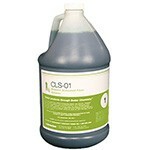 CLS10 is a broad spectrum germicide for mopping or spraying hard surfaces. CLS10 possesses three-way disinfecting action when used as a detergent-germicide: (1) disinfecting the surface, (2) inhibiting the growth of bacteria, and (3) transforming mops, cloths, or sponges into self-sanitizing articles. CLS11 Detergent / Disinfectant will sanitize previously cleaned and rinsed non-porous food contact surfaces such as tanks, chopping blocks counter tops, drinking glasses and eating utensils.